Ever since I was a kid I’ve loved video games. I used to eat up entire weekends playing games like Rollercoaster Tycoon and Civilization III or duking it out against neighborhood friends on Mario Kart 64, Goldeneye, and Madden. In fact, my friends and I played so much that every one of my N64 controller joysticks eventually went limp and broke. I guess it should be no surprise, then, that last summer I thought, “I should write music for games.” It’s a perfect combination of my love for music and technology. I was confident I had the composition skills and musical knowledge to pull it off, but it requires other skills that I wasn’t so sure about. First, you need excellent audio engineering skills to realize your compositions, and I only had a little experience from a handful of personal projects. Second, if you plan on using orchestral sounds, you have to have a strong grasp on the different orchestral instruments: their timbre, volume, ranges, and so much more in order to create realistic orchestrations. Suffice it to say pulling off a video game soundtrack would be a tall task. I started by getting my hands on the special edition of the Vienna Symphonic Library. It has a bunch of phenomenal samples that run the entire orchestral gamut: strings, woodwinds, brass, percussion, and more. While the special edition doesn’t have all of the different articulations, it’s still an excellent sample library that would get me very far on its own. Next, I composed a couple demo tracks and posted them to a number of game dev communities like TIGSource and GameJolt. From there it all happened pretty quickly. Within a couple days, artees on the GameJolt forums asked me to score his game Forged Adventure in exchange for profit-share. Now that I had a real project, it was time to see what I could do. Or rather, it was time to see what I couldn’t do. Once I started doing serious composing for Forged Adventure, my lack of experience quickly caught up to me. I had some good ideas, but the complexity of everything was holding me back. I could easily execute some ideas while others were fraught with struggle. I often added extra parts just for the sake of it, which resulted in over-orchestrated arrangements. I also struggled to figure out how to properly balance the volume of all the individual parts which resulted in unbalanced mixes. Much of that early work was pretty mediocre. One of the more unexpected challenges was the sheer volume of ideas that are needed. You need to be able to pump out theme after theme just to have enough good ones to pick from, and even once you have a good one to work with, you have to write enough variations and complementary ideas to fill 3 or 4 minute tracks. 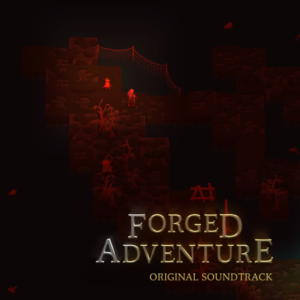 In total the Forged Adventure soundtrack is only about 13 minutes long, but I definitely underestimated how much work it takes to write that much music. Despite the difficulties, what an experience it was! I’m very proud of this material. Writing it was a great challenge, but it turned out to be one of the most rewarding things I’ve ever done as a musician. The most surprising thing was how liberating it felt. I’ve written classical, jazz, pop, and rock, and I always felt very boxed in, always questioning whether a particular idea “fit” within the genre for which I was writing. With video game music, though, I felt no such constraint. As long as the mood of the music matched the atmosphere of the game, anything within my musical palette is available for use. Prioritizing mood over genre resulted in a freedom that I had never felt before, and I believe it had profound implications for my creativity. On to the next soundtrack!